Every year I do my best to forget about my birthday. I really couldn’t care less about that day but there are a few people in my life that refuse to ignore it. Every year I tell them the same thing. Don’t buy me a gift, just tell me you love me. If you want to make a card and say it that’s fine but all I really want is to know that I’m loved. Inevitably, someone will get me something and then I have to do all those weird calculations to figure out how long I have to keep it until I can throw it away. Trust me, a card saying “Thank you for being my friend – you’re a big part of my life” means more to me than anything you could ever put on a credit card. Connection is the only currency I accept and that goes double on holidays. There has only been one time where someone knew me so well and loved me so much that even now, 17 years later, I still treasure what she gave me. My heart sank. Angie was the first woman I had ever fallen fell head-over-sneakers for. For the first year of our relationship we were like a pair of parentheses. Everything we did became “our thing.” New books, new music, new food, it was all part of some magical world we created that no one else could see. I’m sure we made some people sick the way we walked through the world playing with each other. We were that couple who had a special phrase for everything and laughed at things no one else understood. Blech, right? Well, not when it’s you. It’s pretty damn great when it’s you. But all that didn’t keep from worrying about this birthday gift. I couldn’t bear to think of Angie giving me something that wasn’t perfect. She took my hand and told me this story. “The other day I was an estate sale and this little old German lady came up and started talking to me. I said I was looking for a present for my boyfriend and I told her all about you. She had this really thick accent, like she just got off the boat, but I was able to understand everything she said. “Yes!” Angie yelled back, as excited as I was. I could not believe what I was hearing. Angie knew I loved reading WWII histories but she also knew that I loved codes. I used to make them up when I was a kid. Meeting a German war refugee who escaped from the Nazi’s and worked at Bletchley Park was just about the most amazing thing I had ever heard. But Angie wasn’t done. I couldn’t even speak. I just nodded. Yes, I would like to see the Enigma Machine. The thing that broke the code and saved the free world? I most definitely wanted to see it. It was dark by this time as she led me up the steps to her house. But instead of going inside she led me around the outside of the house to the back yard which had a small stand of trees in it. The moon was out and there was just enough light for her to guide me to one tree where she sat me down on the ground in front of what was probably the last Enigma Machine left in the world. Well of course I just started crying. I’d been waiting all my life for someone to know me like this but I never expected to find her. And here on this night, under this tree, I had found the person I wanted to spend my life with. She was the Enigma Machine that was built just for me. As I sat there crying there another feeling began to surface. Underneath all the love was a great fear were rising up. I knew I wanted nothing more than to be with Angie, but 150 miles away there was someone else I was already with and could not abandon. Angie lived in Bellingham but my son and I lived in Olympia, two-and-a-half hours away. He was eight years old and outside of Angie my life was devoted to him. He saw his mother every other weekend but spent the rest of the week with me. We were inseparable. We played, we sang, we drew comics together. We took funny pictures of each other in goofing around in Goodwill and followed stray cats around the neighborhood. I never saw myself as a parent but once Taran was born I was happy to be his dad. Angie was living in Olympia when we started dating but her home was Bellingham and she eventually moved back. I couldn’t blame her. You know when you’re in the car and you hear the first few notes of your favorite song come on and you start bouncing up and down waiting to start singing along? That’s what Bellingham was to Angie. Every time we would visit, she would start dancing in her seat as we drove over the last hill and she could see Bellingham ahead of us. It was her favorite place in the world and she longed to return to it. It’s the windiest town in Washington and she was like a kite I could barely hold onto. So in that perfect moment under the tree reading “I love you” from the woman I adored I knew it was all going to slip away. As much as I think I can always pull another trick out of my hat I knew I couldn’t tear my son away from his mom and I couldn’t live with the guilt of abandoning him to live far away with someone else. Angie, I know now, understood that. We tried to keep it together, visiting each other when we could afford it. But it couldn’t last. We broke up a few months later when she realized I couldn’t be there enough for the kind of relationship we both wanted. I still have the Enigma Machine and I think about it often. It’s the most beautiful thing anyone has ever given me. The gift I wanted more than anything, though, was for Angie to stay in Olympia. Now, years later, I can say that I’m lucky I never got that gift. I wouldn’t be the dad I am now and have the same relationship with my son if I had left Taran in Olympia or taken him with me to Bellingham. It would have been tragic for him to move away from his friends and his mother and that would have made it tragic for me. Sometimes the thing you want most is the thing you should never get. And that’s the kind of story we’re looking for this month. The theme is “You can’t always get what you want.” Tell us a story about a time when you wanted something but didn’t get it. How did it affect you? Did it change how you felt about the thing you wanted? Are you glad things worked out the way they did or do you still wish things had been different? 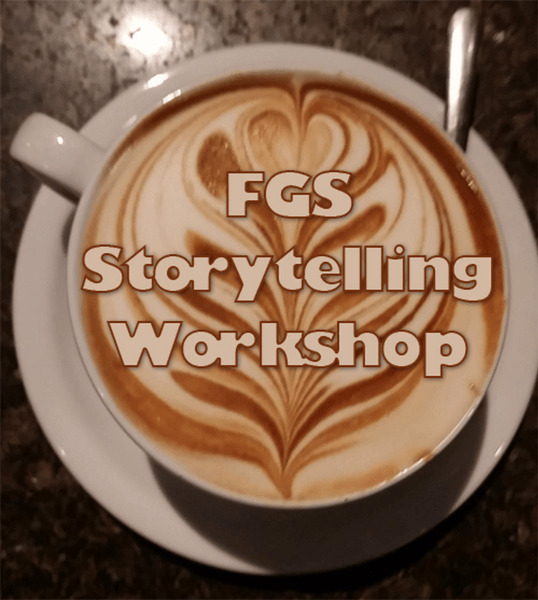 I hope to see you at the next FGS, Thursday, Sept 22, 7:00pm at the Roy St Cafe.